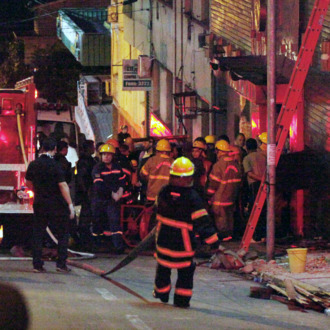 At least 233 people died in a fire at Santa Maria, Brazil’s Boate Kiss nightclub early Sunday* morning. The blaze seems to have started after a member of a band performing at the packed venue set off a flare inside at around 2:30 a.m. A police official told Reuters that the fire spread “in seconds,” and when a security guard passed the band’s singer a fire extinguisher it failed to work. Amid the panic and thick smoke, patrons were unable to find their way to the club’s exit, which was “partially blocked by those already dead,” reports the AP. Others tragically mistook the bathroom door for an exit. Most of the victims are said to have died from asphyxiation, while the death toll is expected to rise as authorities continue to search the space for more bodies. The fire has so shocked the nation that Brazil’s president Dilma Rousseff even cut short a summit in Chile to visit the hundreds of injured clubgoers. *An earlier version of this post incorrectly stated that the fire took place on Saturday instead of Sunday.